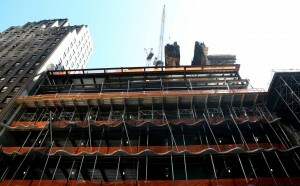 A block south of Central Park in Manhattan, construction crews are working on the base of what is poised to be the tallest apartment building in the country and the latest condominium tower to cater to the super rich. It is also poised to be the latest skyscraper to benefit from a provision of a federal immigration program meant to aid distressed neighborhoods and rural areas, offering a striking example of what lawmakers and critics have called a widespread abuse of the program known as EB-5. The builder, Extell Development Co., recently began seeking foreign investors through the immigration program in a bid to raise nearly $200 million to help finance the tower’s construction. Gary Barnett, the company’s chief executive, said he is following all rules for the program, and the tower is expected to create “thousands” of jobs that might otherwise not be created as traditional condo financing is tough to secure today. “Given the financing environment that currently exists, it’s a critical component,” he said of the EB-5 funding. The EB-5 program grants permanent residency to aspiring immigrants who invest in certain U.S. businesses measured to create jobs. A minimum investment for a standard business is $1 million, but in an effort to aid development in struggling areas, investors can put in a lower amount—$500,000—if a project is considered to be in a rural area or a high-unemployment neighborhood. Developers like Extell have flocked to the program in recent years, almost always for projects in prosperous neighborhoods that use the category meant for the rural and high unemployment areas, a level at which it is easier to find immigrant investors. The practice is legal so long as state officials and developers craft special districts that connect the projects with high unemployment neighborhoods—a method termed “gerrymandering” by critics. But because the program has rapidly ballooned to overcapacity—there is a yearslong wait for the 10,000 visas allowed annually under the program—many of the flashiest and largest projects are crowding out projects in rural and poor neighborhoods, EB-5 professionals say. That has sparked a fight in Congress. Numerous lawmakers, Obama administration officials and academics have said it runs counter to the intent of the law. A set of real-estate developers who use the program have pushed strongly back against proposed changes, however, successfully winning the ear of some influential lawmakers sympathetic to their arguments. A showdown could come in September, when the program is set to expire—though last year a similar deadline was extended with no changes. Consultants for Extell in China this month began seeking up to 380 investors—at $500,000 each—according to multiple websites advertising the project. The skyscraper would be the tallest and most prominent of the recent spate of slender towers that aim at the superrich on the strip of 57th street that has been dubbed “Billionaires’ Row.” It would rise to 1,550 feet, 300 higher than the Empire State Building, and a website advertising the tower to prospective foreign investors says it would set a new bar for luxury, becoming a “new generation of top towers” in New York. While construction is under way on the lower floors—to be home to a sprawling flagship for Nordstrom department stores—Mr. Barnett hasn’t yet secured all the financing necessary to build the condo tower atop. The super-high-end market has weakened significantly amid greater supply and less demand, causing lenders to pull back. Despite the pullback, Mr. Barnett is trying to push ahead and secure financing, of which EB-5 would be a relatively small piece of a project expected to cost more than $2 billion. “There’s such a financing crunch that a lot of projects won’t get done without EB-5, and this is one of them,” he said.